Buy at Turnberry Ocean Club condo also known as Sole Mia Condo that realizes an ambitious goal of Turnberry Associates to design and build a glass tower of luxury residences with such unparalleled amenities and breathtaking views that it would raise the world’s standards of innovation in residential design in Miami. Backed by their half-century experience in delivering world-class service in nontraditional surroundings, Turnberry Associates has provided with this development at 18501 Collins Avenue, Sunny Isles Beach, a new definition of what is possible in oceanfront private club living in the Miami area and beyond. 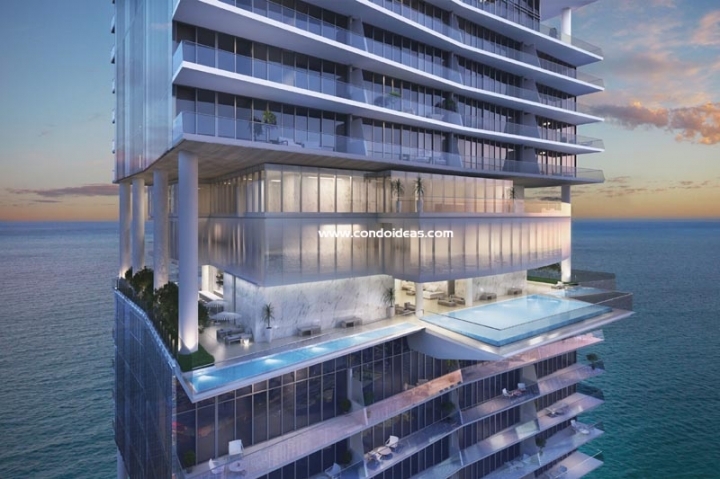 Architects Carlos Zapata and Robert Swedroe have devoted the fifty-four glass-clad stories of Turnberry Ocean Club to six floors of amenities and 154 flow-through residences with direct ocean and bay views. 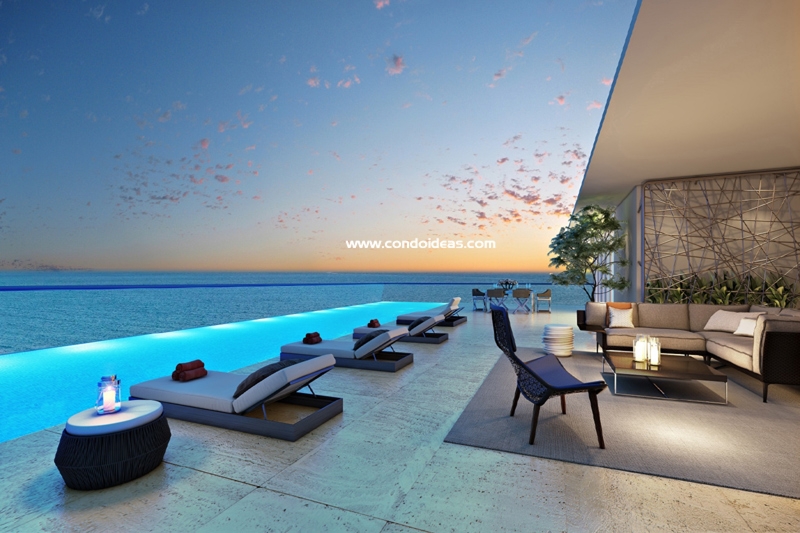 Each residence is extended into the open air with an 11-foot deep oceanfront balcony. This expansive space hosts a summer kitchen with barbeque grill. On the bay side another balcony balances the flow-through scheme. Collection duplex residences take full advantage of their double height, offering 20-foot high living room and balcony ceilings. They also include private pools and hydrotherapy spas. Residences are served by high-speed, direct elevators, while also featuring private service entrances and laundry rooms. Each residence features a family room and staff quarters with full bath and closet. Both kitchens and baths repeat the theme of sleek elegance with imported Snaidero Italian custom cabinetry and exotic imported stone countertops. Baths feature marble walls and flooring. Bathroom fixtures are by Dornbracht, complemented by Vali and Vali door hardware throughout. These residences, with their prime coat finished walls and imported interior doors, are designer-ready. Supporting the expansive residential units are additional storage spaces, underground valet parking, underground motorcycle and bicycle storage and electric car charging stations as well as a car wash area. The ambitious standards of Turnberry are reflected in the dramatic arrival entrance with its multiple water features. 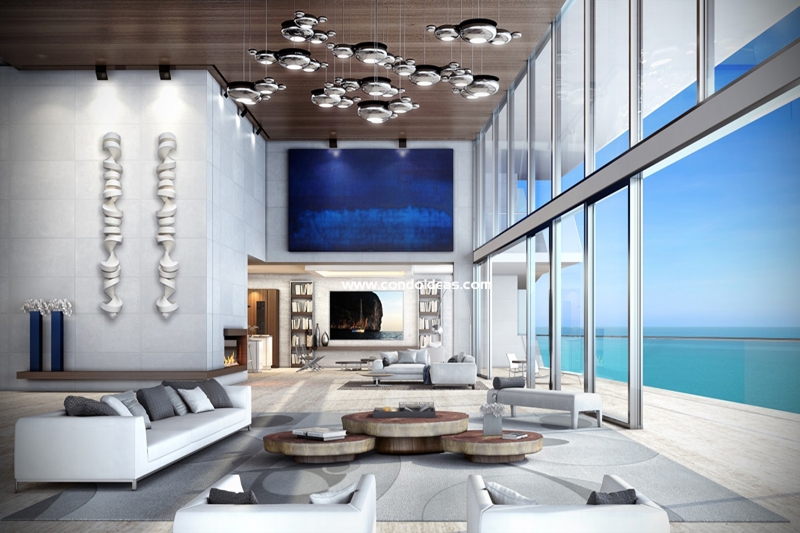 The glass lobby admits direct ocean views through three-story windows. On the lobby level find an ocean-view infinity pool with complete poolside service, a pool bar and a restaurant. Beyond lies the private beach, dotted with lounge chairs and umbrellas and provided, of course, with full beach service. Have a need or question? Rely on your full-time multi-lingual concierge service supported by 24/7 valet and security personnel. 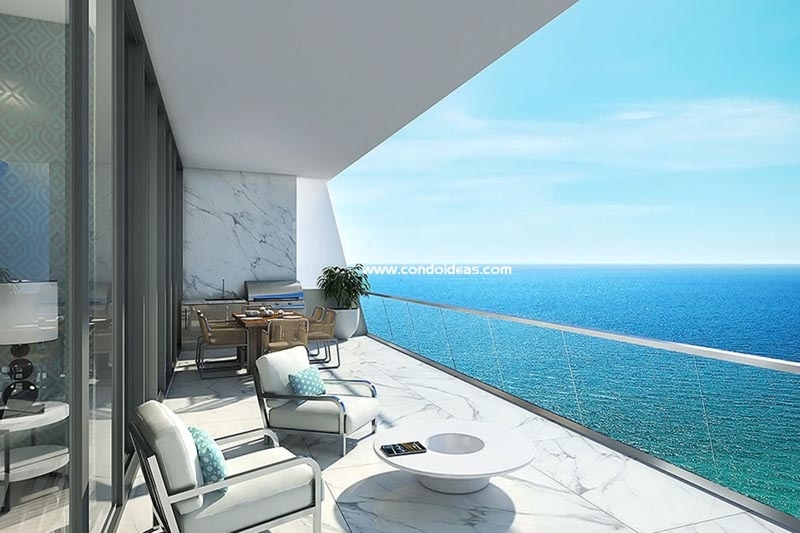 Turnberry Ocean Club offers six floors of amenities that include three swimming pools, three private dining areas and three bar-and-lounge areas. Thirty-five ocean view cabanas are available for purchase. Entertainment areas include The Kid’s Club multi-purpose playroom and the 18-seat cinema screening room. On the 30th Floor find a sunrise and a sunset swimming pool, two hydrotherapy spas, four-day cabanas, an outdoor pool bar and an outdoor sky theater. The 31st Floor provides for fitness needs with an indoor fitness center and an outdoor open-air gym as well as a yoga and Pilates studio. Four treatment rooms join a revitalization spa with relaxation lounge. 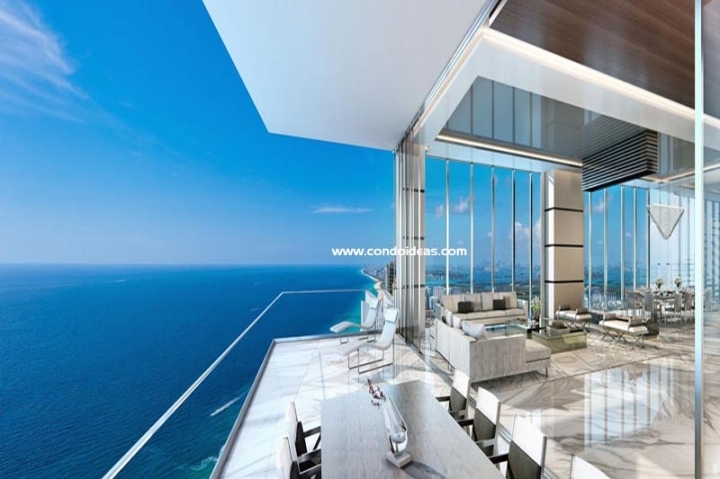 Just above, the 32nd Floor offers spacious indoor and outdoor dining areas with a catering kitchen, a sunset lounge and social room with an indoor and outdoor bar and an outdoor pet retreat. 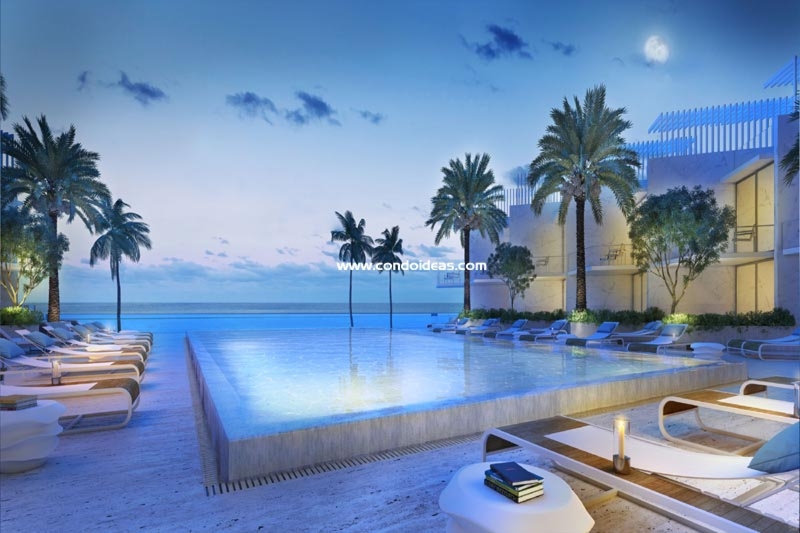 Ownership of a residence in the Turnberry Ocean Club development includes the opportunity to purchase membership privileges at Turnberry Isle Resort with its golf, tennis and marina activities. 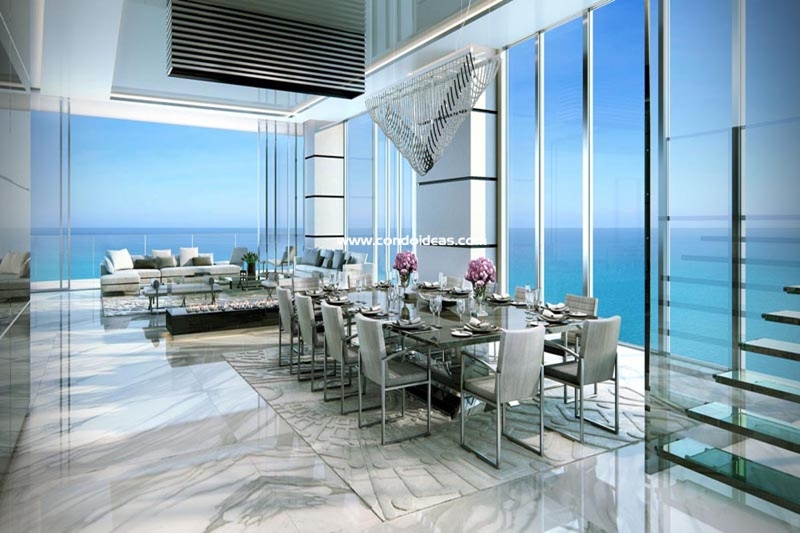 Take advantage of the full Turnberry experience while you also explore the beachfront of Sunny Isles, its neighboring dining, shopping and cultural opportunities. Discover why this residential opportunity truly puts you in touch with the best South Florida has to offer.